A little over a week ago the snow level was a couple of thousand feet. 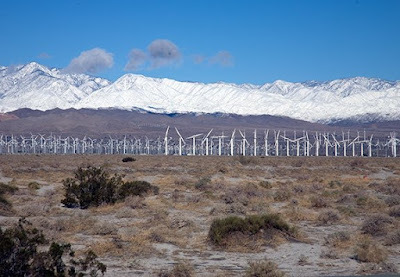 Anyone want to place a bet that it will fall in Palm Springs proper this winter. It has in Las Vegas. Palm Springs has gotta be next! Oh, by the way, the above pic came out without any blasts of white because I used a polarizing lens on my camera (a 5D). Feel free to email me at matthewbam@aol.com if you have any questions about photographing in Palm Springs or about getting my book The 50 Greatest Photo Opportunities in San Francisco. Freshly fallen snow is the backdrop for this year's Palm Springs Christmas tree at City Hall. 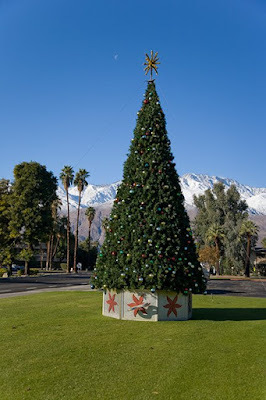 The snow juxtaposed against the Christmas tree and palm trees are perfect together, just what the tourist board loves. Come to Palm Springs and you get to look at snow without a feeling its cold reality. MY NEWEST BOOK IS 50 GREATEST PHOTO OPPORTUNITIES IN SAN FRANCISCO. Please preorder this coffee table and how-to photography book for some stunning photography of the City by the Bay. A few weeks ago the carnival came to town. 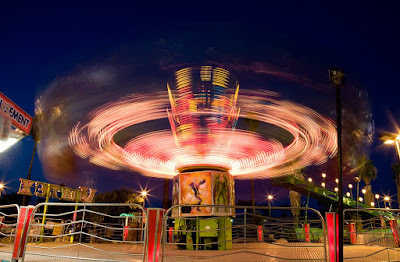 I pulled out my tripod and Canon 5D and headed downtown where the carnies set up shop. In this exposure I left my shutter open for several seconds. HEY, PICK UP A COPY OF MY BOOK, 50 GREATEST PHOTO OPPORTUNITIES IN SAN FRANCISCO!!! 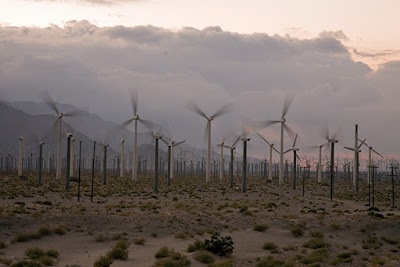 I've always wanted to get a picture of the windmills around here with their fans moving. I got it. It wasn't easy cause first I had the shutter speed too fast and you couldn't see the fans at all. Do the math. It doesn't take all that long a shutter speed to get these moving. You light has to be just right. In this shot the light could have been better. Please pick up a copy of my book! I'm back! More about that in my next post. At any rate, the Christmas parade, formally called the Palm Springs Festival of Lights Parade, was a hoot. More than 8,000 people lined the streets merry-making. The pic above was part of the parade's finale. 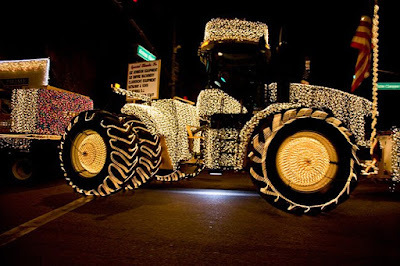 Imagine that, a tractor covered in Christmas lights rumbling down the street in all directions. Don't forget to pick up a copy of my new book, "50 Greatest Photo Opportunities in San Francisco." The book comes out in about 2 weeks!